The world is full of problems that need solving—and our inspired students are up to the task. The Grade 7 Change Makers Project gave students a chance to come up with creative and original solutions to problems relating to crisis relief, environmental stewardship, and inequality. Let&apos;s find out what our student-innovators came up with! Change makers at UWCSEA come in all shapes, sizes and grades, but they have one big thing in common: they bring bright ideas, relentless drive and admirable dedication to their mission to tackle real-world problems. Change Makers is a project-based learning initiative, crafted around our Service curriculum. Grade 7 students embarked on a journey to work collaboratively with some 17 partner organisations - from the Singapore Zoo to Mercy Relief - and emerged with inventions and ideas that challenged old ways of thinking. By incorporating elements of systems and design thinking into problem solving for real-life challenges faced by partners in our service programme, students were encouraged to push the envelope and apply their critical-thinking and problem-solving skills to a real social issue. It wasn&apos;t just about coming up with solutions out of context, either; students had to also keep their selected organisation’s mission, capacity and limitations in mind. One Change Maker group embarked on a project that presented a pop-up cafe for Blue Dragon, a Hanoi-based non-profit who works with vulnerable street children. The problem they were looking to solve was how to feed the malnourished children in their care with nutritious and affordable produce - because standing in their way every month is a massive, unsustainable food bill. The Change Maker experience taught students the true value of risk-taking, out-of-the-box critical thinking, and planning for an uncertain future. Said Reuben, a member of the group, "I think this (project) is essential since jobs are starting to disappear because of technology, so you need to be able to learn things quickly and come up with ideas to solve problems in the future that may not be able to be solved by machines." Another Change Maker group came up with the ingenious idea of a do-it-yourself laundry detergent, to reduce the amount of toxic waste released into our environment. Projects like these embody the idea that action for environmental sustainability does not have to be costly to be effective. Our Change Makers are encouraged to consider solutions that are affordable in the long-run for organisations and the communities they target. It doesn’t just stop at ideas for our young Change Makers. 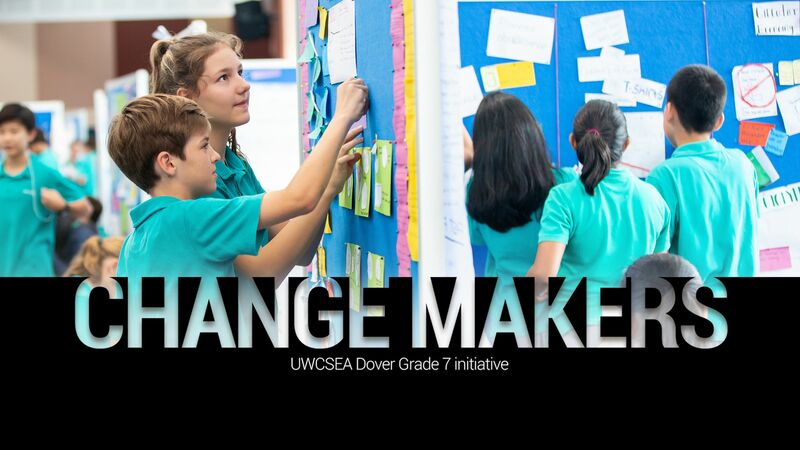 UWCSEA Dover will next pilot a mentoring programme that allows students to develop their concepts to more workable and considered proposals, in close consultation with mentors from local universities and professional design companies to help make their concepts and ideas a reality. We wish our Change Makers the very best with their brilliant innovations! The Change Maker Project challenged students to work on real problems, faced by real organisations working towards sustainability. Our teachers worked with our Service partners to develop problem statements for students to test their critical-thinking and problem-solving skills - falling in line with UWCSEA&apos;s goal to educate future Change Makers who will work towards fulfilling our mission to create a more peaceful and sustainable future. Click here to understand our Learning Programme.